Ask fellow campers about " Silver State RV Park (formerly Winnemucca / I-80 KOA)" and nearby attractions. This looks like a very new park. Except for the sites on the outside edges (some of which are for tents), all the sites are pull-thrus. Sites are gravel and level, we'll-separated. There are stones on the area between sites with the picnic tables. Our little dog didn't like walking on the stones but otherwise it was fine. The park's WiFi and our TxMobile service both worked well here. We would stay here again. We camped at Silver State RV Park (formerly Winnemucca / I-80 KOA) in a Motorhome. The office sells what they call Chicago hot dogs. 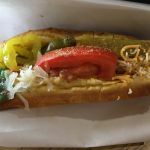 I'm from Chicago, so take it from me: it's edible but no Chicago dog! They also sell ice cream by the scoop which is a nice treat. Electricity wasn't enough to run our air conditioning. Park not well kept. Looks like it might have been nice park at one point, but they have not maintained it. Would not stay here again. We camped at Silver State RV Park (formerly Winnemucca / I-80 KOA) in a Fifth Wheel. 2 dog runs, nice sites. We will return. We camped at Silver State RV Park (formerly Winnemucca / I-80 KOA) in a Fifth Wheel. This is a very convenient KOA to/from I-80. Typical for the area - few trees, very little grass with gravel between the spots. The pull through spots are fair but very dusty. The park needs some TLC. Many of the gravel borders are missing, there are a lot of weeds and the road is in poor condition. Not bad for a one night stay but there are other nearby options that get good reviews that this KOA needs to catch up to. We camped at Silver State RV Park (formerly Winnemucca / I-80 KOA) in a Fifth Wheel. We overnighted at this park. The staff was very friendly. Roads and sites are gravel, easy to navigate and level. The park has a nice pool which was great after a day of driving. 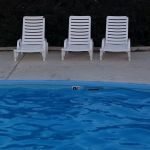 Other than the pool, we didn't use any of the facilities,but they seemed adequate. The park is convenient to I-80, but far enough off that road noise was not a problem. We would camp here again. We camped at Silver State RV Park (formerly Winnemucca / I-80 KOA) in a Motorhome. We have stayed here many times as we travel east and west on I80. In fact we make this our stop whether going home or going east. The owner and staff do everything they can to make your stay enjoyable. Check in is quick and easy and you are escorted to your site. The park is very clean and maintained. RV supply store is better equipped than most and they have added a vape counter for those who vape. Hot dogs and hand dipped ice cream in clubhouse. New items in the park is a glamping cabin with 2 bedrooms and full bath and small wooden like yurts that have one bed, a full bath and a mini kitchen. This park continues to improve and I highly recommend staying here. We'll see you next year! 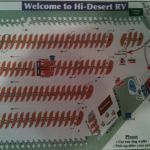 We camped at Silver State RV Park (formerly Winnemucca / I-80 KOA) in a Motorhome. On arrival I didn't like it that much. It was windy, hot and dusty day and the fact that sites are dirt and gravel doesn't help. We were checked in fast and escorted to site, plus they let us park our van and trailer for free in the back row, we appreciated that. The park grew on me as some time went by and it turned out to be actually pretty nice. 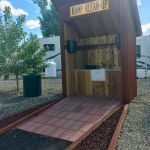 They have very cool features, such as miniature Western set up and a hammock by a koi pond at the entrance, yurts and cabins for rent, tents cleaning and dog washing stations. I have to mention separately their decent size swimming pool 8 ft deep on one end that was a delight on a hot day! They light a camp fire every night from 7 to 9:30 and it makes the camp look very cozy. Our site was somewhat unlevel but we managed, some spots have trees and bushes. Mostly young people work in the reception and maintenance, all very helpful and look very busy around the park. Showers, restrooms and laundry room are spacious and clean. There is a gym with some basic equipment, a small store, and they also serve hot dogs and ice cream right there at the club house. Overall I would say it is a nice park and we got unbeatable price of $150 per week, so we were pretty satisfied with everything. I would stay there again if in the area. We camped at Silver State RV Park (formerly Winnemucca / I-80 KOA) in a Fifth Wheel. First of all I'm not a KOA fan, in fact I will avoid a KOA campgrounds just about at any cost. But when I saw the $19.99 a night and have stayed at this park prior to it being a KOA: I said what the heck I'm gonna try it out again. The park is still in the desert so there's no way of getting around the dust. But there has been some changes: a lot are KOA changes. Their store now has a hotdog area which is very good. Also they are starting to serve ice cream which is another very good. The park has a nice dog wash which we used. Overall the park looks tidy but you're never going to get away from the dust and dirt as long as you're in this type of environment. The inside store has a excellent RV miscellaneous parts very, very good, probably one of the best I've ever seen. The laundry room was clean, and appealing to use. We had an issue with one of the dryers, but that was it. They will refund your money if there is an issue. I would stay here again late in the fall at this price. 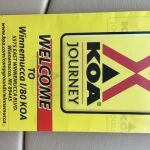 I don't know if I would pay the full blown KOA price, but sometimes convenience has a cost. I've said that before but we will definitely come back. Road noise for us was not an issue as we were probably about in the middle of the park. We camped at Silver State RV Park (formerly Winnemucca / I-80 KOA) in a Motorhome. Dose Amigos: very, very good Mexican food. Check in was very pleasant with very nice people. We do travel through Winnemucca several times a year and this was the first time we stayed at this park. The sites were of a good size, services worked just fine and the price was better than anticipated. There are some long timers there but most sites are pull through. Good place for an over night or a few nights, but it is desert so there can be wind and dust and lots of SUN!! Again... great people at the front desk. 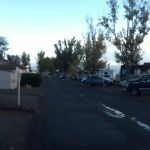 We camped at Silver State RV Park (formerly Winnemucca / I-80 KOA) in a Travel Trailer. First Impression: Nice roadside presentation. Safety: No concerns. Access: From I-80, take exit 180 onto East Winnemucca Blvd; from US-95, turn left onto Winnemucca Blvd then right onto East Winnemucca (just before the I-80 on-ramp). Municipal road in good condition, good signage, Garmin GPS is accurate. Office: Nice staff, excellent store with snacks, food items, soft drinks, beer, serve-yourself hot dogs, and a selection of RV equipment items. Credit cards accepted. Online reservations available. KOA price discount, only. Facilities: Heated pool. No spa, fitness room, or rec center. Laundry room. Clean restrooms/showers, no mold, average fixtures, hot water with good pressure (score "A"). Propane sales. Small playground. No off-leash dog run. Campground: Not in a flood plain. No storm shelter. Decorative trees; lightly wooded. Interior roads are sufficiently wide, packed gravel in good condition with kinda' tight turns; no overhead obstacles. Big rig and long coaches need to be mindful of where your tires are as sites are narrow, timber lined with protruding rebar. Prevosts could have problems. Tent area but no yurts or cabins. Sites are all close, sufficiently level (#123 was seriously tilted - front jacks bottomed-out), sand and gravel, pull-through (short back-ins around perimeter), stone between. Pedestal locations vary from mid-rig to rear of site, electric 20/30/50; no meters. Moderate water pressure with good taste. Sewer pipe is 3" threaded, at ground level. No patios; nice (plastic) picnic tables. No room for ground fires; no fire rings. Good satellite views. Free cable TV. Free Wi-Fi but poor coverage, pages would not load. Verizon phone and 4G at 4 bars. No recycle bins. Noise: Distant railroad, no aircraft or local traffic noise but interstate traffic is audible. Bug Report (mid September): flies, flies, and more flies. Runners: gravel roads marginal for running. Yoga: no good place to put your mat. Conclusion: Score 5-Acceptable, good price. We camped at Silver State RV Park (formerly Winnemucca / I-80 KOA) in a Fifth Wheel. The town was named for the 19th-century Chief Winnemucca of the local Northern Paiute tribe. Winnemucca, loosely translated, means "one moccasin." (Wikipedia). Small town, population under 5,000. No major restaurant chains, a few fast food restaurants, numerous local eateries. Walmart, Autozone, O'Reillys. Couple of small casinos. Best diesel at Maverick ($2.859) on East Winnemucca Blvd. Landromat. Small, two screen movie theater. No Starbucks (a unit of measure for the wife). Nice overnight stop with beautiful mountain backdrop. No issues. We camped at Silver State RV Park (formerly Winnemucca / I-80 KOA) in a Motorhome. Typical KOA. Old, dirt, bad roads, dusty. What else can be said. It's a OK stop over for the night. Staff very friendly. Met by staff, taken to site. Never went to the office. They delivered the receipt a short while later. Did have some I-80 road noise from truckers but not a problem. Heard the train way off in distance too. Some shade but largely sunny. We camped at Silver State RV Park (formerly Winnemucca / I-80 KOA) in a Motorhome. We only stopped overnight. The park seemed spacious and well-kept. Asphalt and gravel. We arrived late in the evening and left first thing the following morning but it was a great park for a quick stop-over. We camped at Silver State RV Park (formerly Winnemucca / I-80 KOA) in a Motorhome. Great place, lot of amenities for families, pool and play ground. Had great air conditioned laundry room. Clean restrooms. Concrete pad and gravel site surface. Picnic table. We camped at Silver State RV Park (formerly Winnemucca / I-80 KOA) in a Travel Trailer. Good park for overnight stop. Easy on and off highway. Looks like work is being done on the park. Tight spots. We would visit again if in the area. We camped at Silver State RV Park (formerly Winnemucca / I-80 KOA) in a Fifth Wheel. Try their Chicago and New York hotdogs...very good! Are you affiliated with Silver State RV Park (formerly Winnemucca / I-80 KOA) ?